After Saturday's win at Ottawa, Toronto is 12th in the Eastern Conference and trails Philadelphia and Boston, tied at the postseason cutoff, by four points. The Toronto Maple Leafs aren’t giving up on a playoff berth. They’re making life miserable for the Ottawa Senators in the process. The Leafs stayed in the playoff hunt in the Eastern Conference by rallying from a 4-2 deficit for a 5-4 victory in Ottawa on Saturday night. It was Toronto’s third consecutive victory and fifth in six games — as well as the Leafs’ fourth in a row against their provincial rivals. "We're showing what keeping the faith can do for a team," forward Alex Steen said. "We don't quit." The victory gives the Leafs 80 points; though they’re 12th in the Eastern Conference, they’re just four points behind Philadelphia and Boston, which hold the final two playoff spots. More impressive than the Leafs’ six straight road wins is the fact they're winning without captain Mats Sundin and Nik Antropov, both of whom are sidelined with injuries. "This was a big win for us," said forward Matt Stajan, who scored the game-winner 2:14 into the third period, 41 seconds after Jiri Tlusty tied the score at 4-4. "We're battling for our lives and with the injuries we have we're showing what kind of guys we have. We're not going to give up." The Senators remained in fifth place in the East with 89 points after blowing a two-goal lead amid a host of turnovers and giveaways. "Breakdowns, once in a while you take advantage and when you don't you lose hockey games," Ottawa coach Bryan Murray said. "The two goals they got were from passes to two of their guys." The Senators delighted most of the sellout crowd at Scotiabank Place by jumping to an early lead when Daniel Alfredsson caught Toronto goalie Vesa Toskala out of position and scored at 2:56 of the first period. The Senators dominated the rest of the period, outshooting and outhitting the Leafs badly, but couldn’t beat Toskala again. Toronto showed more life in the second period, tying the game at 4:14 on Kyle Wellwood’s power-play goal and taking the lead at 12:39 when Steen beat Martin Gerber with a lot shot from the slot during another man advantage. But the Leafs then started a parade to the penalty box, and Ottawa took advantage. Cory Stillman tied the game with a power-play goal at 15:04, banging in the rebound of his own shot. Martin Lapointe was left alone and beat Toskala 58 seconds later, and Dany Heatley made it 4-2 at 17:31 with another power-play goal, tucking in a rebound off the end boards. The Leafs were reeling, but they composed themselves in the final stages of the period and cut the deficit to 4-3 when Darcy Tucker rifled a rebound past Gerber at 19:06. "It's frustrating when you get a two-goal lead and blow it," Ottawa center Jason Spezza said. "You've got to be able to hold on to a lead going into the stretch drive." The battle for first place in the Atlantic Division turned into a rout when Pittsburgh blew open a tight game with five third-period goals, sending Martin Brodeur to the bench and the Penguins two points ahead of the Devils. ''We didn't expect (seven goals), but we'll take it,'' said forward Ryan Malone, whose shorthanded goal in the second period broke a 1-1 tie. ''Sometimes that's how it works. They played last night, so we wanted to kind of jump on them early. Malone and Evgeni Malkin each scored twice and Marian Hossa added three assists as the Devils allowed seven goals in a game for the first time since last March 17. Malone’s shorthanded goal with 3:46 to play in the second period turned the momentum in Pittsburgh’s favor. He converted a perfect pass from Pascal Dupuis on a 2-on-1 break to put the Penguins ahead to stay. "From that point on, we made a lot of mental mistakes," New Jersey coach Brent Sutter said. "We had lots of breakdowns. We weren't very strong between the ears the rest of the game. Malone’s power-play goal at the three-minute mark made it 3-1, and Dupuis scored 1:51 later to send Brodeur to the bench. Malkin scored twice and set up Petr Sykora’s goal as he passed the 100-point mark in his second NHL season. The Pens, one point behind Montreal for the Eastern Conference lead, are 6-0-2 in their last eight games at Mellon Arena. But their next two games are on the road — they visit the New York Islanders on Monday before a rematch with the Devils at the Prudential Center on Tuesday. New Jersey will be looking for revenge after its worst loss of the season. Sutter was very displeased with his team after New Jersey lost for the third time in four nights. Florida continued its own late run and completed a 6-0-1 homestand by downing its in-state rival to move within three points of a playoff berth. Tomas Vokoun made 36 saves — 32 in the last two periods — to beat the Lightning for the 12th time in their last 15 meetings. 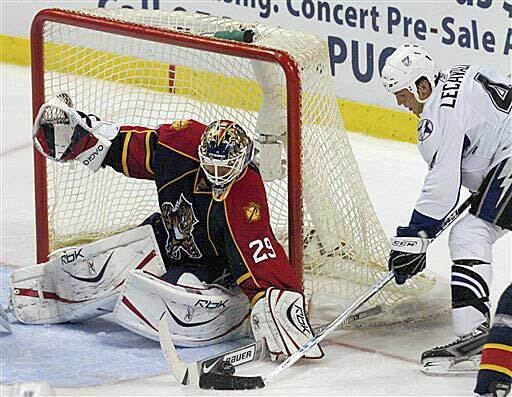 Tampa Bay’s Vincent Lecavalier also felt Vokoun was the difference. The Panthers are now 8-0-1 in March and haven’t allowed more than two goals in any of those games. The Panthers got some early help from Tampa Bay goalie Mike Smith, who threw a clearing pass that ended up on the stick of Florida’s Jay Bouwmeester. He rifled the puck into the vacated net at 3:31. Junior Lessard tied it for Tampa Bay with his first goal of the season at 6:13 of the second period, converting a passout from Mathieu Darche. But Florida regained the lead at 7:28 when Nathan Horton beat Smith with a high shot from between the circles. Olli Jokinen gave Florida some breathing room at 10:10 of the third period. With Dan Boyle in the box for hooking, the Panthers captain took a backhanded pass from Brett McLean and beat Smith with a slap shot. Horton added an empty-net goal with 2:17 remaining before Tampa Bay closed the scoring with Darche's sixth of the season with 1:11 to play. Detroit reached the 50-win mark for the third straight season as Pavel Datsyuk had a goal and two assists and the Wings limited Columbus to just 12 shots on goal in their third meeting in seven days. No NHL franchise has put together three consecutive 50-win seasons since Montreal did it four times in a row from 1975-79. ''That's impressive. You go through all the years of hockey, Scotty Bowman did it with Montreal in the '70s,'' Red Wings coach Mike Babcock said, ''but this is the cap world now. It's going to be hard to do. “I'm fortunate enough to be the coach, I'm proud to be the coach." The Wings lead the overall standings with 106 points, but don’t try to tell Babcock that his team should be the prohibitive favorite for the Stanley Cup. Babcock did concede that this is easily the best team he's ever coached. Columbus coach Ken Hitchcock didn’t have many nice things to say about his team except for captain Rick Nash, who scored the Jackets’ only goal early in the third period. "I know you try to win and lose as a team, but our captain tried to carry us on his back and he didn't have enough people going with him,” Hitchcock said. “He tried to win the game by himself — he tried to drag as many people into the fight as he could. We didn’t have enough people dragged in." Datsyuk set up goals by Nicklas Lidstrom and Henrik Zetterberg in a 3:39 span of the first period, then completed the scoring by beating Fredrik Norrena for a shorthanded goal with 5:03 remaining. Nash scored Columbus’ only goal 43 seconds into the third period. Johan Franzen’s tip-in with 7:08 remaining made it 3-1. The Stars lost their fourth in a row thanks to another third-period meltdown, this time against the NHL’s worst team. Stu Barnes' second-period goal put Dallas ahead 2-1, and the Stars seemed on the verge of snapping their skid as the third period wound down. But Michal Handzus stole the puck from defenseman Trevor Daley and scored from the slot with 3:01 left in regulation to tie the game at 2-2. Lubomir Visnovsky then put the Kings in front with 2:06 remaining when his shot from the left point beat a screened Marty Turco. Handzus scored off a rebound with 1:19 to play. Dallas has been outscored 11-0 in the third period of its last six games, including 8-0 during the losing streak. Dallas had won 13 of 15 before the slump dropped the Stars behind San Jose and Anaheim in the Pacific Division. They have 89 points, fifth in the West. Brenden Morrow’s first-period goal put the Stars ahead, but Kings’ captain Rob Blake scored a power-play goal 5:48 into the second period. Barnes put the Stars back in front at 11:32 with a wrist shot from the inside of the right circle. The Stars had won their last seven home games against the Kings and were 11-1-2 overall against the NHL’s 30th-ranked team over the past two seasons. The Kings have continued to play hard while pointing toward next season. The Oilers’ unlikely playoff surge continued at the expense of the Avalanche. Rookie Sam Gagner scored twice as Edmonton won for the 11th time in 14 games and moved within three points of the eighth-place Avs in the West. But it wasn’t easy. Edmonton blew the 4-1 lead it held after two periods within the first 4:16 of the third — only to have Marc Pouliot put the Oilers ahead to stay 18 seconds later when he swatted in a rebound for his first NHL goal. Gagner’s second of the game gave the Oilers enough of a cushion to survive a late goal by John-Michael Liles before Marty Reasoner was awarded a goal with 10 seconds remaining when he was hooked by Paul Stastny while skating with a clear path to the empty net. That’s something the Avs aren’t doing. Colorado went 0-3 on a road trip against Northwest Division rivals and went from contending for the Northwest Division title to worrying about making the playoffs. Dustin Penner’s goal 50 seconds into the game triggered a three-goal first period for the Oilers, knocking out Avs’ starting goalie Jose Theodore in the process. Tyler Arnason’s backhander past Dwayne Roloson at 4:58 of the second period got Colorado on the board, but Kyle Brodziak scored on a breakaway at 9:14 to restore the Oilers’ three-goal lead. Colorado caught a break early in the third as Ruslan Salei's long dump-in from the point caromed off the knee of Oiler defender Denis Grebeshkov and through Roloson's legs at 1:43 to make it 4-2. Joe Sakic earned his 1,000th career assist when set up a goal by Wojtek Wolski at 3:41, and Milan Hejduk tied the score 35 seconds later — only to have Pouliot quickly put the Oilers back in front. Nashville revived its playoff hopes thanks to a 37-save performance by struggling goaltender Dan Ellis and the first successful shootout attempt of the season by Alexander Radulov. The win, combined with Colorado’s loss at Edmonton, moved the Predators within two points of the eighth-place Avalanche in the West. 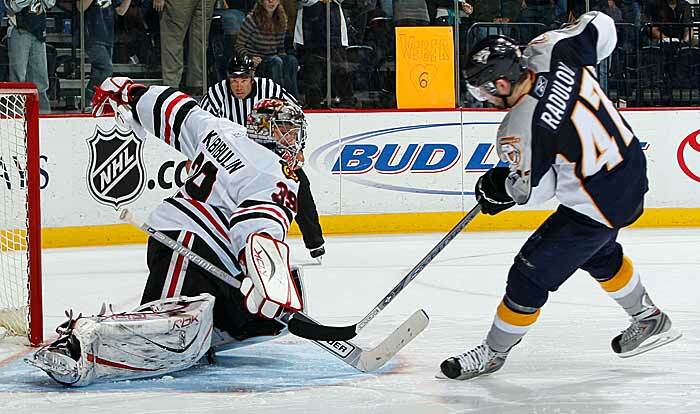 Jason Arnott fired in a rebound 5:24 into the game to give Nashville a 1-0 lead. Chicago tied it at 14:42 when Andrew Ladd redirected Dave Bolland’s pass behind Ellis. That was the only shot to beat Ellis, who had been pulled in each of his last two starts. Ellis saved the day for the Predators by stopping Bolland’s breakaway bid with 1:48 left in regulation, then stopped eight shots in overtime — including big stops on Rene Bourque and Duncan Keith. With the shootout tied at 1-1, Radulov came in, deked Nikolai Khabibulin and slid the puck between the goaltender’s legs for his first goal in eight attempts this season. Ellis made a sprawling save on Patrick Sharp to win the game. "I don’t want to give out any secrets, but I was really nervous,” Radulov said. “When they were announcing who would take the shots, I was hoping that they would not call my name. J.P. (Dumont) was beside me and he patted me on the back and told me to take my time and to put it in. It was a huge play." Trotz had no qualms putting Radulov, Nashville’s third-leading scorer, into another shootout. The Blackhawks are all but out of the playoff race, but coach Denis Savard was pleased with their performance, if not the outcome. Jarome Iginla carried the Flames within a point of the Northwest Division-leading Wild, scoring a natural hat trick in a seven-minute span. Iginla tied the game at 2-2 when he beat Josh Harding with 23 seconds left in the second period. He then put the Flames in front when he scored 50 seconds into the third period and completed his seventh career hat trick when he made it 4-2 with a wrist shot past Harding at 6:37. The third goal triggered a shower of hats from the crowd at the Pengrowth Saddledome and halted play for several minutes. The Wild could have put some room between themselves and the rest of the division with a victory. Instead, they remained at 89 points, one in front of Calgary and three ahead of Vancouver, where the Wild won on Friday. Calgary is 6-0-2 in its last eight home games and has won six of the seven games with Minnesota this season. Dion Phaneuf put the Flames in front three minutes into the second period with a highlight-reel shorthanded goal. He picked up the puck in his own zone, weaved his way up ice and, with only his right hand on the stick, managed to beat Harding. Rookie Benoit Pouliot tied the game at 13:12 when his pass hit defenseman Cory Sarich and went into the net for his first NHL goal. “It was pretty ugly, but I’ll take it,” he said. He got his second at 18:24, converting a pass from Pierre-Marc Bouchard to put Minnesota ahead — briefly. The Wild didn’t quit after Iginla’s hat trick. Kim Johnsson made it 4-3 at 10:07, and after Matt Lombardi’s breakaway goal at 18:18, Johnsson scored again on a blast from the left circle with 55 seconds remaining. With Jean-Sebastien Giguere sidelined due to back spasms, Jonas Hiller stepped in and gave the Ducks a second straight solid performance in goal, stopping 30 shots and making Teemu Selanne’s two goals stand up for the win. Hiller made 41 saves in a 2-1 loss at San Jose on Friday in a game in which the Ducks were outshot 43-13. Anaheim managed just 15 shots in Phoenix, but Hiller allowed only a third-period power-play goal by Ed Jovanovski. Hiller excelled despite playing with a bandage on his forehead — a souvenir of a shot by San Jose’s Jonathan Cheechoo that hit him in the mask on Friday. The victory solidified the Ducks in fourth place in the Western Conference with 94 points, five ahead of fifth-place Dallas and five behind Pacific Division-leading San Jose. Hiller kept the Coyotes scoreless through two periods, robbing Shane Doan, Jovanovski and Radim Vrbata in the middle period. Jovanovski scored a power-play goal at 3:26 of the third period to tie the game at 1-1, but Selanne beat Ilya Bryzgalov with a snap shot from the right circle at 10:40 for a power-play goal. 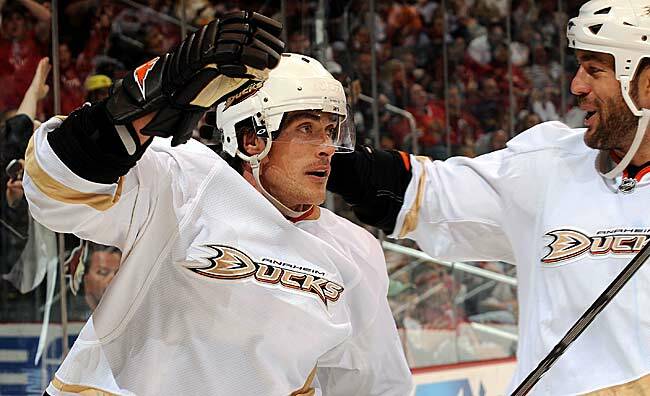 Selanne gave the Ducks a 1-0 lead 6:11 into the game when he took a pass from Todd Bertuzzi, raced into the Phoenix zone on a breakaway and beat Bryzgalov with a backhander. Hiller is making the most of his chance for more playing time. The Coyotes’ fifth straight loss may have all but ended their playoff hopes. With 78 points, they’re six out of the last playoff spot in the West with six games remaining.